Our last Choose Your Eternity poll showed us that a rustbucket BMW 2002 beats a fossilized Nissan 300ZX, albeit by a fairly narrow margin. And that's good to know, though such knowledge won't be applicable to the cars our friend Mike sent in to us. Even though Mike didn't get a Project Car Hell Tipster T-shirt for the burnt Subaru he sent in earlier, he does get one for today's Choose Your Eternity contestants. You'd have to look pretty hard to find a pair of cars that better epitomize everything this series stands for; the combo of amazing car any sane gearhead would kill to own and near-impossibility of ever fixing the thing up... well, just check 'em out! 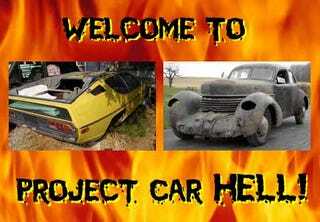 Project Car Hell, Richmond Edition: 2002 or 300ZX? We should warn you right off that today's first contestant requires some travel for most potential buyers, since it's in Italy. But don't let that deter you from slapping down a thick stack of British pound notes (5,000 pounds, to be exact), because what we've got here is a genuine 1973 Lamborghini Espada! Yes, you heard right- the craziest-looking Lamborghini ever made, complete with loony V12 engine and... wait, scratch that last bit- there's no engine in this car. Also no transmission. The seller, no doubt in a particularly candid mood, states "of course it needs restoration," and we agree strongly with that statement. But so what? All you need to do is buy this BMW V12, mate it to some kind of mid-engine transaxle (hey, use your imagination! ), and you're in business with full-on V12 power! Man, this project is just too easy. But when you're contemplating a Hell Project of this caliber, you might need to consider the Decadence Factor. Sure, a '73 Espada is fairly decadent, but how about a high-end statusmobile from one of the darkest years of the Great Depression? Hell, back in '36 you could feed 1,000 Dust Bowl refugees for a year with what it would have cost to buy a new Cord... and that's whey this 1936 Cord 810 Westchester is the car for you! Imagine rolling down the Las Vegas Strip in a fully restored Westchester, with your beefy bodyguards brandishing grenade launchers at over-inquisitive bystanders from the back seat and the showgirl of your choice riding shotgun. Yes, it's a pretty picture... and to put yourself in it you just need to buy this car (the seller of which refuses to state a price in the ad), and then spend the rest of your life chasing down '36 Cord components. The seller freely admits that the car "is missing some pieces," which qualifies for Understatement of the Year. Then there's the "repaired" engine block (we figure JB Weld is involved). But hey, you get "boxes of parts" as part of the deal! OK, so you get that BMW engine we mentioned earlier and you're .000052% of the way there!